Does it have a wide temperature range? Does it come with a Manufacturer’s Warranty? 2. How should I use a meat thermometer? 3. How frequently should I calibrate my meat thermometer? Whether you are buying your first meat thermometer or are replacing one that has gone bad, you can rely on trusted meat thermometer reviews for answers to your questions. We have done the grunt work to uncover ten effective meat thermometers that you can try for yourselves. With the ThermoPro TP-08 meat thermometer, you can set the alarm to alert you when your meat is perfect! This alarm also tells you when your oven, smoker, or BBQ grill is at the right temperature for the task ahead. Setting up your meat temperature is easy and hassle-free. Just insert the batteries you received and the thermometer is ready to use. Notice that the receiver and transmitter of this thermometer are already pre-synchronized by the manufacturers, so you don’t have to fiddle around with these settings. The count up and a countdown timer so you avoid overcooking your meats. For fast and accurate temperature readings in one go, you need the Lavatools PT12 Javelin Digital Instant Read Meat Thermometer. You may say this is the top meat thermometer available on the market and is a gold standard for meat thermometers. Why is that so? The simple answer is that it is ultra-fast! Within 4 seconds you have a temperature reading at your fingertips. Leave the guesswork out of your meat preparation for good! Not only is the Lavatools Javelin a product approved by the NSF to be used professionally and commercially, it is also compliant with tough food-safety requirements of the CE and the RoHS. This means this instant-read meat thermometer is really safe to use and free from mercury, lead, cadmium, and other harmful substances. Lavatools Javelin is made to last as it is constructed using polycarbonate that is 100% free of BPA. It can withstand impacts that cause cracking and warping and you can enjoy over 4,000 hours of constant use on a single battery charge. An 18/8 stainless steel probe houses the Javelin’s sensor for maximum performance, safety, and durability. Expect to have the Lavatools Javelin meat thermometer for quite a long time. Very fast readout – up to 4 seconds with an accuracy of ±0.9°F. Lavatools offers a lifetime warranty on your purchase. You won’t be disappointed with the ThermoPro TP-03A when you use it for grilling, roasting, or cooking your meat. This effective thermometer is your best solution for the most precise temperature readings in a jiffy. The design of the ThermoPro digital food cooking thermometer is simple but practical. With a push of a button, you pop open the foldaway probe and insert it into the meat for a quick and accurate reading. Once you are finished checking your meat’s temperature, fold the probe into its place, making sure that it is kept clean and safe. Get the same results on your meat as the pros do every time with this meat thermometer. With this best digital meat thermometer option, you won’t have under-cooked or overcooked meats ever again. It is powered by triple A batteries which are included. Here is a cool thermometer that will pleasantly surprise you – the CDealer Instant Read Thermometer. Not only is this thermometer more accurate than the best cooking thermometer you might have heard about, it is also one of the most economical thermometers you can find. The probe is foldable so you can easily put it away until you are ready for it again. In your baking or cooking business, it is always good to have a reliable instant-read thermometer like the GDealer within your reach. 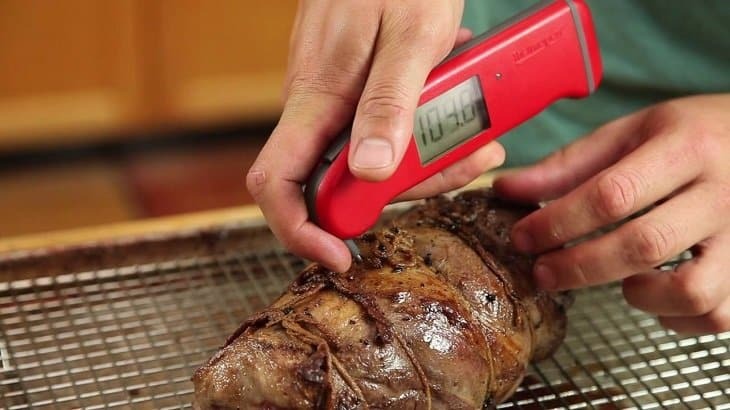 Your grilled, roasted, cooked, or baked meats will always come off perfectly because of the accuracy of this thermometer that allows you to maintain the right temperature. Use your kitchen and outdoor grill with confidence that you will produce excellent meats, candies, milk, coffee, liquids, and other masterful cooking. The temperature range is wide – between -58℉ (-50℃) and 572℉ (300℃) with a pinpoint accuracy of ± 0.1℉. You may also prefer a product from the makers of the best meat thermometer for oven use. In that case, the Habor Instant Read Thermometer is your solution. Within just five seconds you can see the temperature of your meat with this instant-read thermometer. No more would you need to open your oven to check whether your chicken, turkey, fish or ham is done right. Simply turn your meat thermometer on and test your meat’s temperature. You can choose to read the temperature in Celsius or Fahrenheit. It’s really quite easy to get accurate temperature readings from this handy device and you won’t be sorry to have it in your kitchen or grill. In using this meat thermometer remember that steam or heat will affect the temperature reading you get so keep the display area away from the heat. The thermometer has a temperature range of -58℉ (-50℃) to 572℉ (300℃). Underprepared and overcooked meats are things of the past, thanks to the Kizen ultra fast meat thermometer. You won’t have to suffer the frustration of waiting on a slow and unreliable thermometer while your meat burns. The fast and precise temperature readings from the Kizen will greatly improve your kitchen prowess! Within as little as two seconds, the Ultra Fast Premium Probe produces temperature readings to +/-1 degree of accuracy. That is a superior performance compared to many of the best rated meat thermometer products out there. You can confidently prepare your meats, deep-fried foods, baked goods, candy, and any food and hot beverage perfectly all the time! The probes made of food grade stainless steel are also coated with an antibacterial agent to protect against the growth of foodborne bacteria. Other useful features include the Max/ Min //Hold temperature function, the backlit LCD display, and a battery that is pre-installed (you also get an extra battery). Certified by the FED, CE, and RoHS. Quickly check the internal temperature of any meat you are preparing with the ThermoPro TP-17 Dual Probe Digital Meat Thermometer. Even if you are a cook with little experience in the kitchen, you can produce meats prepared to perfection with the help of the top rated meat thermometer in the kitchen. This dual probe thermometer is built with two probes made of stainless steel that allow you to measure the temperatures of two foods at once. This meat thermometer is very convenient to use on those occasions like Thanksgiving or Christmas family dinners when you are preparing everything in a rush! The ThermoPro is also designed with a step-down probe tip as well as an LCD display that is backlit. This makes it quite easy for you to receive and read temperatures, even in low light. It is flexible and can be placed on a countertop on the flip out stand or stuck to any metal surface by its built-in magnet. You also can keep track of time when preparing vegetables with the timer built into this cooking thermometer. With the ThermoPro meat thermometer, there is no need to take your meat out and poke it ever so often to check whether it is done. Temperature readings range from -14˚F (-10˚C) to 572˚F (300˚C) with great accuracy of ±1.8°F (±1°C). If you want to experience a lightning fast temperature display that is also accurate and trustworthy, look no further than the new Lavatools Javelin PRO Duo. This upgrade from a previous model produced by Lavatools, the makers of what can be considered the best digital meat thermometer products on the market, is bound to blaze a noticeable trail. Already, it has changed the way meat thermometers perform, with its drastically re-designed super-large 2″ display and a 360° view that rotates whenever you change the way you hold the instrument. With its intelligent stabilization function, you are alerted as soon as the thermometer settles on a temperature and it keeps the readout for you to see. As if these improvements were not enough, the engineers at Lavatools reduced the response time of the Javelin PRO to a mind-boggling 2-3 seconds with an ultra-sensitive sensor straight out of Japan. In addition, this thermometer features an accuracy of ±0.9°F so you can certainly trust this performance above all rivals. The Javelin PRO Duo is designed to meet the most stringent global food-safety standards set by institutions such as CE, RoHS, and NSF. That means the Javelin PRO Duo does not contain mercury, lead, cadmium or other substances that are hazardous. You can also use this meat thermometer commercially. Built-in magnet allows convenient storage. You certainly won’t have to contend with uncertainty when preparing meats, thanks to the sleek and slender Taylor Commercial Waterproof Digital Thermometer. With this top of the line kitchen thermometer from the brand known for the best cooking thermometer, you can expect accurate temperature records, fast response time, and easily readable displays. Your meats will always be perfectly done and your family and clients will be happy with your cooking results! Trust the Taylor line of food thermometers for the highest standards of performance that Chefs the world over love and trust. It is NFS certified and compliant with the most rigorous of food safety standards. That said, this meat thermometer is also effective in producing accurate temperature measurements in Degrees Fahrenheit or Celsius (you choose) which you can see clearly on its 0.8 inches display in black, bold numbers. Approved by the NSF and supported by a one-year limited warranty. The final option on our list of meat thermometer products is the Habor Meat Thermometer which is an instant-read thermometer for your kitchen. With this versatile digital thermometer, you can prepare meals perfectly without having to prod, cut, slice, or bruise your food. All you need to do is to insert the 4.8 inches (extendable to 10.3 inches) temperature probe into the food (or liquid) to check the temperature of the perfectly cooked meal, on every occasion! Use it for a wide variety of meats including the Christmas turkey, steak, beef, fish, ham, and any barbecued meat. No matter what you are preparing, the Habor Meat Thermometer is your handy tool to check whether you are doing it right! You can get accurate temp readings in Celsius and Fahrenheit and the LCD display is big enough for you to see clearly at a distance. Within five seconds, you will see the temperature thanks to the enhanced precision offered by its sensors. There is no fear of burning your meats to a crisp or pulling undercooked and runny meats from your oven once you are using this highly effective meat thermometer. You can refer to the printed meat temperature chart located on the back of the thermometer. In purchasing your meat thermometer, there are a few things you would need to consider. Instead of being confused or overwhelmed about whether you are choosing the digital meat thermometer, why not take the time to get answers to the following questions? If you want to achieve a perfectly cooked, baked, or roasted meat every time the one thing you need the most is an accurate meat thermometer. From the many brands out there ensure that the temperature readings you will get are precise. Of course, you would want the meat thermometer to give you accurate temperature readings quickly. A fast-acting thermometer is the best option in a busy kitchen and will mean the difference between a perfectly done meat and a kitchen disaster! Zero in on instant-read thermometers that will produce a temperature reading within 3 – 10 seconds. How a meat thermometer functions is also an important factor if you want to improve your cooking and meat preparation experience. A functioning meat thermometer includes features that you will find quite useful. If all you want is a simple thermometer to take the temperature, then most brands will satisfy that need. For those who are looking for a little more than that, the Top Rated Meat Thermometer options also go from Celsius to Fahrenheit which is good for dealing with exotic recipes, present the temperature to the 10th of a degree, and rotate the temperature display based on the angle they are held. Meat thermometers also come already programmed with standard meat cooking temperatures and you are alerted whenever they are reached. Other meat thermometers give a beep whenever they are stabilized, and you can also use some thermometers as timers to help you monitor both temperature and time. The meat thermometer for oven purposes should also operate within a wide temperature range. When you work with a meat thermometer that offers a wide range of temperatures you will be better able to cook or prepare a wide variety of meats. If you need a thermometer that also works with a variety of foods, then you must have a thermometer that has an extended temperature range. So, for instance, the typical meat thermometer would offer temperatures ranging from 32°F to 392°F, while an all-purpose thermometer would need a wider temperature range especially on the lower end of the scale. This might not be such a big deal to most persons but accessories may help in deciding whether the meat thermometer you are about to buy is the one for you. The best kitchen thermometer also comes with a few accessories like magnets to make it easier to stick it on the side of the grill (or fridge), probes that can be detached, storage cases, among other accessories. Your favorite meat thermometer brand may already offer such accessories, and in that case, great! If you intend to use your meat thermometer for a long time, it is a good idea to check out the warranty from the manufacturer. Most of the meat thermometer brands offer decent warranties. Manufacturer’s warranty may range from one to five years. Digital meat thermometers come in a variety of styles, the all in one style that features a digital screen above a metal probe, the removable probe model, and the increasingly popular trigger style infrared thermometer gun. Digital thermometers also have alarms that beep when the desired temperature is reached and large easy to read displays. They are usually more expensive, but they provide a much more accurate temperature reading. Downsides include their difficulty to calibrate, inaccurate malfunctions (at times), and the required batteries which you must change when they go bad. Analog meat thermometers are not as precise as the digital, which is quite frustrating if you want the perfectly done meat. They are, however, much easier to clean up (even with hot water and soap), and they are very affordable. Analog thermometers are also easy to calibrate and do not require batteries. Their downsides are that they cannot be read from a distance because of their display of small dials and there are no other features like a beep to tell you when the meat is ready. So, if you care about precise and accurate temperature numbers and convenience, then the digital meat thermometer is the top meat thermometer for you. Even the meat thermometer deserves to be cleaned and maintained. Every time you use it, you must clean and sanitize your thermometer probe to prevent the build-up of harmful microorganisms (bacteria). Allow the probe to dry by air completely, or dry fully with a single-use towel. Not all meat thermometers are waterproof or dishwasher safe, so don’t submerge in liquids! Ensure that your thermometer is completely dry before storing. If you are familiar with how to use a meat thermometer, you can skip this section. For those who are less sure or are clueless about using this kitchen apparatus, here is a brief rundown. First, you would need to ensure that the digital meat thermometer has batteries included. If so, insert them if they were not already pre-loaded. Once the batteries are in, turn the power on (models with power buttons would allow this). Meat thermometers that include probes can be used to test your meats and other foods by inserting the probe into the food item. For instant-read thermometers simply insert the probe, wait around 15 to 20 seconds for it to register the temperature then check the display for the temperature readings. You have the choice of temperature in degrees Fahrenheit or Celsius, which you can make using the temperature switching function of most models of the digital meat thermometer. Avoid steam while checking the temperature of your meat or food as steam interferes with the actual reading of the meat itself (You will be reading the steam’s temperature). Also, except for the oven going meat thermometer, never put your digital meat thermometer inside a closed (and hot) oven as it will be destroyed. No doubt in our review of the meat thermometer brands on the market you would have found an overwhelming flood of information. Top meat thermometer brands are outstanding in the high standard of their products, the great online customer reviews from satisfied customers, and the recommendations of various meat thermometer reviews. While you may consider other top brands based on the factors just mentioned and other factors you think are quite important, here is a shortlist of popular brands that have consistently produced the best instant-read meat thermometer products and other tools for your kitchen. 1. Can a meat thermometer produce temperature readings in Celsius or Fahrenheit? Certainly, many of the meat thermometer brands can display temperature readings in Degrees Celsius and Degrees Fahrenheit. You will find the function buttons or Mode switches that allow you to move between these two kinds of temperature readings. If in doubt, check with your supplier to demonstrate how this is done. A: A meat thermometer is an important part of your kitchen arsenal to enable you to prepare meat that is safe to eat. For the best results, insert the probe in the thickest section of the meat, making sure to avoid the fat and bone. Check the temperature readings to ensure that it is at the right temperature for the meat you are preparing. Also, compare your temperature readout with the minimum and maximum internal temperature guide prepared by the USDA. This way you are sure to operate within food safety guidelines and your final results will be perfect and great to eat! While most might consider the act of calibrating thermometers one that involves making changes to the instrument to improve accuracy, in the case of meat thermometers, it is simply to test the temperature readout against a known standard. The test most often referred to is the comparison of the temperature readout to boiling water. Of course, many persons would know (from basic science lessons) that boiling water is 100 degrees Celsius. So, to calibrate your meat thermometer involves a simple reference test such as boiling water temp. It is recommended that you calibrate your analog meat thermometers daily and the digital meat thermometer can be calibrated at least once per year. Check the information on your meat thermometer brand for the recommended frequency. There you have it! Our review of meat thermometers and recommendations of the ten best meat thermometer options you should try. Not only do you now have information to compare top meat thermometers before you buy, you are able to answer a few questions as you make up your minds. The bottom line is that your cooking and meat preparation in the kitchen and the BBQ grill will improve tremendously with the right meat thermometer. You won’t have to guess whether your meat is done. Your friends and family will be quite impressed with your perfect grilling and cooking results.